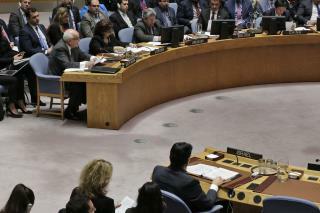 (Newser) – "What we witnessed here in the Security Council is an insult. It won't be forgotten." Such was US Ambassador to the UN Nikki Haley's assessment after the US on Monday vetoed a UN Security Council resolution demanding the US reverse its Dec. 6 decision on Jerusalem. The Egyptian-drafted one-page resolution did not include the words "United States" or "President Trump," reports Reuters, but the target was clear. The resolution described "deep regret at recent decisions concerning the status of Jerusalem" and stated "any decisions and actions which purport to have altered the character, status or demographic composition of the Holy City of Jerusalem have no legal effect, are null and void and must be rescinded in compliance with relevant resolutions of the Security Council." Haley is a hoe bag who only represents Trumpita and not the whole country. Trumpita is a laughing joke. The UN has been nothing but a BS foot puppet for decades now, no surprise.